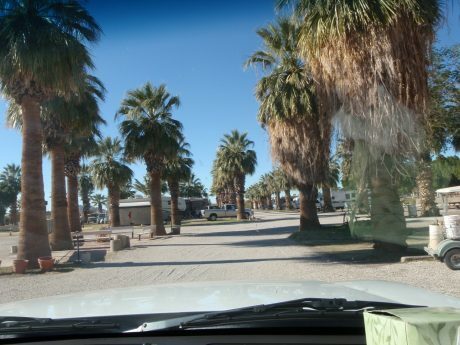 Sans End RV Park in Winterhaven, CA is right across the border from Yuma, AZ. It’s kind of odd to think that a city can be a suburb of a city on another side of the border, but that’s kind of what Winterhaven is. Not so much in the sense that many suburbs are only bedroom communities to the actual city, but in the sense that WInterhaven has almost no services and you’d have to drive across to AZ to get whatever you need. I think the bigger benefit of where this park is located is that it’s about a 10 minute or less drive to the border crossing into Los Algodones, Mexico. 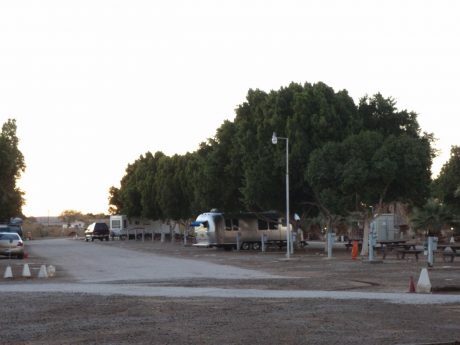 There is an RV Park that is closer to the border, like almost in the parking lot of the US Border Patrol, but it was expensive and basically a bunch of trailers on a dirt site. Some people chose to camp out in the desert off the road too, which is cheap or free but not very comfortable unless you like being in a big sandbox. 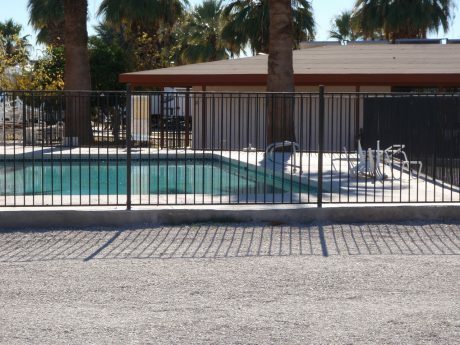 Sans End RV Park itself is decent, not fancy but what you get for the price of $29/night is okay. 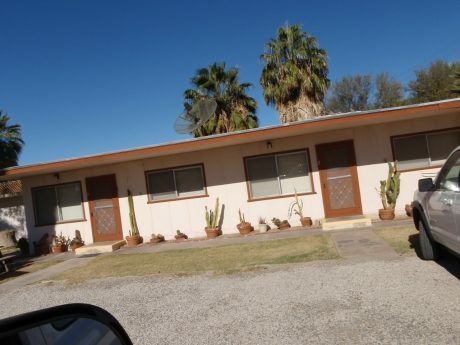 We stayed one night, just to cross into Algodones for some budget shopping. They have showers, a swimming pool and quite a few spaces. If you are traveling with pets (we are of course) then you get to (have to) stay in the pet side of the park. This side has no grass between the spaces, so it’s just dirt. It’s not so bad, but somehow the part where you look over the fence to see the spots with grass makes you feel like you’re a lower class person just because you travel with pets. I wouldn’t stay here for all that long because of that. Another alternative off the same exit, but south of the interstate (we were north of it) is Rivers Edge RV Resort. It’s a much much larger place and was pretty much packed to the gills. We didn’t see it until we were already settled in at Sans End, but I wouldn’t have wanted to stay there anyway. All the spaces were right on top of each other, and there was just too much hustle and bustle going on, but apparently it’s a popular alternative for many, many people. I think they had something like 600+ spaces but I don’t remember for sure. The Roads around the park are loose gravel, and the buildings are what appears to be 60’s vintage roadside-special. We didn’t use any of the other park facilities since we’re self contained so I can’t comment on those. When we were picking the place to stay, some of the reviews mentioned a train that goes by across the street, and the busy street that the park is on being an issue for those people. First, the ‘busy street’ is the main street off I-8 into Winterhaven from the west side. Sure, there was some traffic occasionally and it is by far the busiest street in Winterhaven (I think they have like 6 streets total) but nowhere even close to what ‘busy street’ means to anyone who’s from a more populated area. It’s more like a quiet country road. As for the train, yep it does go by at night. I heard them blowing the horn a few times, somewhere around 8pm. After that I was sound asleep and didn’t hear it again so maybe they went by and maybe they didn’t. The Airstream is very soundproof compared to most other RV’s I’ve been in and even in truck stops or other loud places we barely hear anything from outside unless a window is open. One of our neighbors – we had about 4 of them on the pet side of the park, all at least 5 spaces away – was an older gentleman who’s wife had recently died. His daughters had set him up at the park for the winter, and I guess he’d been coming for years. He knew all the ropes about getting to Algodones as most people call it, skipping the “Los” part and wasn’t shy in striking up a conversation about anything on his mind. It struck me like he was the type that needed to keep moving and busy with something, but didn’t really have much to keep him busy and nothing to tinker with. We talked with him 4 or 5 separate times over the course of our less than 24 hour stay, and at the end he gave me a zip lock bag full of what I thought originally was fried chicken. Ugh! Well, on closer look it wasn’t fried chicken at all, it was a bag full of heavenly tasting peanut butter cookies. These were awesome, and I don’t even like peanut butter cookies! Mr. Iforgetyourname, thank you! The cookie man’s name is Paul and is a fixture in the park. He’s the best! Your pictures of the park are great. You captured the essence of what captures people’s interest in the park. But, the best part of the park are the people who frequent it…..both old and new. Most people I’ve met in the park are the “what you see is what you get” type of person, no phoneys. Thanks for the comments. However, this is not the parks official site and I don’t know any of those answers. I’ll leave them here for possible reply from someone at the park, but just be aware that you’re asking the wrong person….